Golf is a game which requires precision and practice. Unfortunately, it’s not always so easy to teach yourself precision! However, if, like me, you enjoy improving your handicap and are interested in learning how to ‘read’ a course a little better, then a rangefinder is going to be worth your while. Laser rangefinders are the best at helping you understand inclines, declines, and pin distances. In this Callaway 300 Pro Golf Laser Rangefinder Review, I’ll be taking a look at what makes this brand and model so desirable. Is it the precision? The value for money? Let’s find out. We’ve all been there. Before taking on a laser rangefinder for the first time, I found slopes extremely difficult to read. Golf is a game of math, under the surface. When first starting out, I struggled to get even the slightest of taps right for the distance required. It’s something a lot of us golfers still go through regularly. We can’t all be PGA Tour pros, which is why I think it’s fantastic that there are many gadgets available to help us understand the intricacies of the course that little bit easier. It can take years before you’re able to read distance to pin and slopes to even a good standard. Even now, I still find myself double-guessing the math. That’s why I think something as reliable as a rangefinder can help new and seasoned golfers alike. That counts for all ages, too. 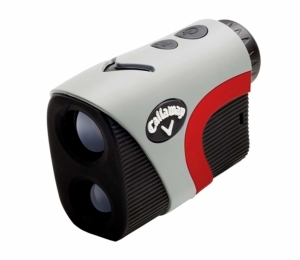 The Callaway 300 Pro Golf Laser Rangefinder is a gizmo which is in a class of its own. It’s a super-lightweight golfing gadget which will allow you to lock onto the pin and will analyze how far your ball has to travel to get there. This model will do well to track the hole up to 300 yards away on average. What’s more, it’s packed with all sorts of other game-enhancing features. What I find particularly helpful is the built-in slope technology. That means that, even if there are slopes and dips on the way to the green, the rangefinder will take them into account. The Callaway 300 promises accurate pin readings of a yard either way. You can also make use of the unit’s scan modes for more precise readings of the course beyond you. You can use the rangefinder to take a good look at the course as it stretches beyond with up to 6x zoom through its simple binocular system. It’s also got a nice little LCD display which actively tells you how far away your target is, and how much battery you’ve got left. The auto-locking system is always going to be useful for players who are new to certain courses, or who struggle to read certain distances at the best of times. However, you’re going to need to be careful with the consistency of readings if you don’t hold it with a steady hand. That might mean some of your readings don’t make much sense, but on the whole, if you’re careful and steady, you’ll get plenty of useful data back. This wouldn’t be a comprehensive Callaway 300 Pro Golf Laser Rangefinder review without considering both sides of the debate. In this Callaway 300 Pro Golf Laser Rangefinder review, I aimed to uncover some of the reasons why even pro golfers should take a look at the gadget. The fact is, I feel it performs well from course to course and can help even the most seasoned of players understand distances. Golf is a game where your precision should get better the more you play. Why not help yourself a little bit along the way? This rangefinder is perfect for anyone just starting on the links, or for those who need a helping hand with lowering that handicap. Why not take a look at the rangefinder for yourself and buy online?